Clean and cut the asparagus in 1 inch diagonal slices. Blanch the cut asparagus in boiling water for 5 minutes and then drain them and cool the asparagus in an ice bath. This will cook the asparagus, set the color and stop the cooking. Once cooled remove the asparagus from the ice water, dry and set aside. In a saucepan heat the chicken stock so it is just simmering. In a Dutch oven heat the olive oil and butter over medium heat. Add the leeks and onions and sauté for 5 to 7 minutes, until tender but not caramelized. Add the rice and stir for a minute to coat with the vegetables, oil, and butter and then add the white wine and simmer over low heat, stirring constantly, until most of the wine has been absorbed. Add the simmering chicken stock, 2 ladles at a time, stirring almost constantly and waiting for the stock to be absorbed before adding more. Continue to add 2 ladles at a time as it is absorbed completely. This process should take 25 to 30 minutes. 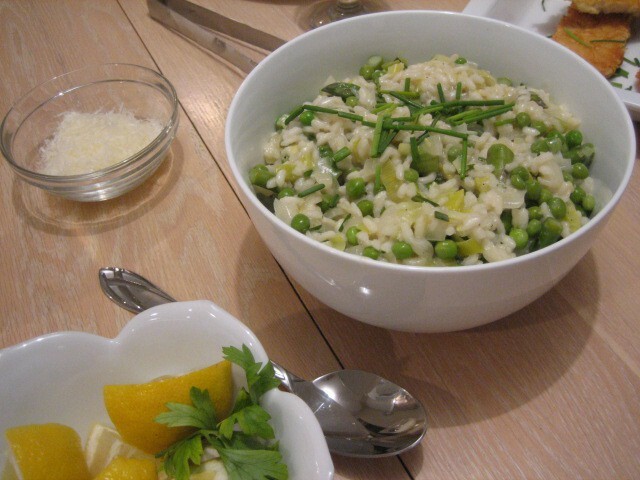 Meanwhile, when the risotto has been cooking for 15 minutes, add the asparagus and the peas, along with the lemon zest, 1 teaspoons salt, and 1 teaspoon pepper. Continue cooking and adding stock, stirring almost constantly, until the rice is tender but still firm. In a small bowl whisk the lemon juice and mascarpone together until smooth and creamy. 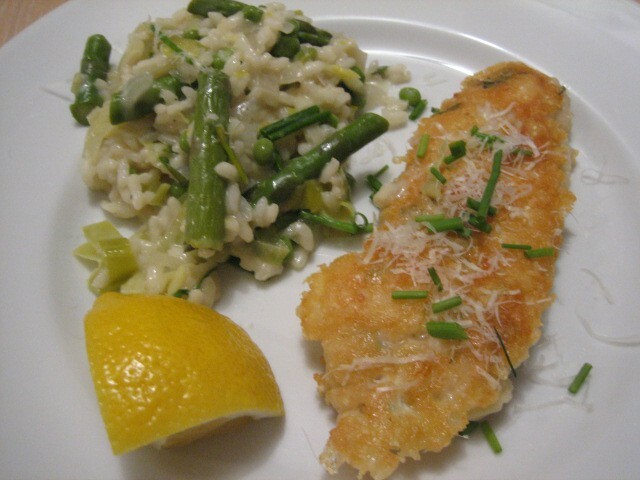 When the risotto is done, turn off the heat and stir in the mascarpone mixture plus the Parmesan cheese and 3 Tbs of the chives. 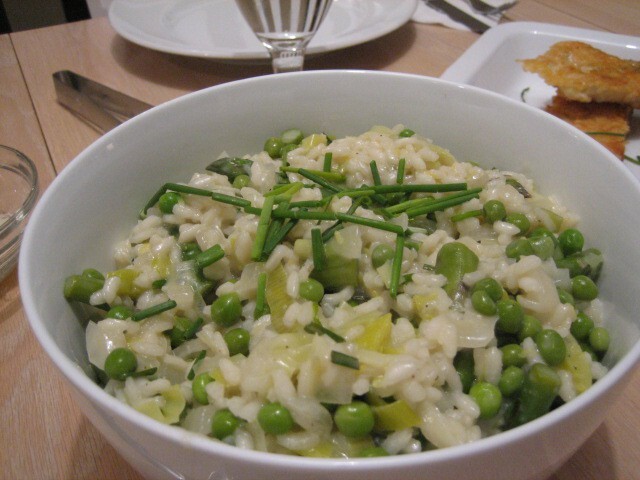 Serve with the remaining 1 Tbs of chives as a garnish.